After days in the freezer, so this was what i cooked for our today's lunch... Macaroni Soup.. itupun selepas teringat macaroni yang di beli di Eco-Shop last month tak di masak2 lagi..hehe.. alhamdulillah inilah hasilnya.. 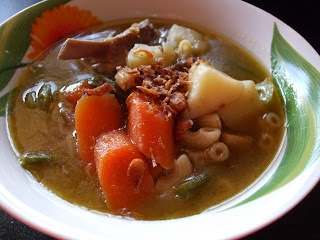 This was how i cooked my soups, Lamb Ribs / any part of meat you like - boiled with pressure cooker for half an hour and i just put soup bunjut tulang from kedai abg man.. tak cukup syarat rasanya kalau sup tak diletakkan vegetables, so in this soup i also put some rooster potatoes, carrots, celery and don't forget the macaroni.. kalau tak bubuh macaroni, tak jadilah macaroni soup kan.. after macaroni dah cukup kembang and softer but still al dente, sprinkle with some daun sup and off the heat.. and put the lid on.. just leave it there for ~15 minutes until the macaroni soften.. Serve.. I like to have it with some rice, but hubby preferred the soup own it's own.. Selamat mencuba.